An essential tool for all sorts of purposes, the wheelbarrow will help you work smarter, not harder. Like all our tools, this 4-cubic foot wheelbarrow is available for Asheville Tool Library members to check out for up to seven days. Just imagine how many loads of leaves you could move to the compost pile in a week with a wheelbarrow at your disposal! Other useful purposes for a tool of this sort may include: general construction, gardening, giving rides to kids and dogs, and moving anything else you can imagine from point A to B that will fit in the wheelbarrow. 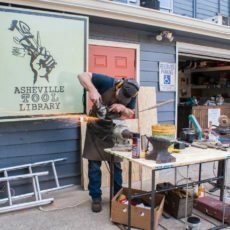 While the Asheville Tool Library does not necessarily encourage giving rides to kids and dogs, we recognize that our members are creative and resourceful. All AVLTL members must first sign a liability waiver before checking out any tools. Please use common sense in observing a reasonable weight limit when using the wheelbarrow.